Common in window frames from the 1950s through today because of its light weight, high strength, durability, and low cost, aluminum is one of the most common window frame materials. However, historically aluminum frame windows suffer poor thermal performance. This is because aluminum conducts heat faster than almost any other building material. The solution is superior design of a mixture of materials to retain aluminum’s valuable qualities without its high thermal conductivity. 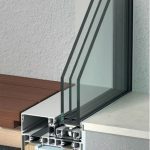 Today’s high-performance aluminum window frame is a sandwich of aluminum on the inside and outside of the frame connected by an incredibly strong polymer (“polyamide” being a common one). You get the durability and strength of aluminum with thermal performance approaching that of wood, uPVC, and fiberglass. Aluminum’s high strength allows for thin frames; typically much thinner than wood frames. Many desire this minimalist aesthetic. However, thin frames have thermal benefits as well. Although few windows (frame plus glazing) insulate as well as a wall, windows can allow desirable passive solar heating in winter. Thinner frames allow more of the window opening in the wall to be glass, and the sunshine passes only through the glass, not the frame. Depending on the size of a window, the type of window if it opens (casement, hopper, awning, etc. ), and the profile of the frame, the frame may take up 10% to 30% of area of the opening in the wall. 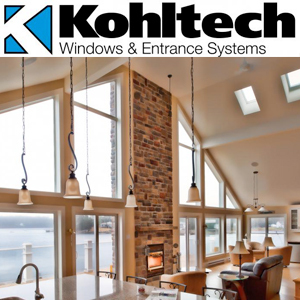 In addition, frames are typically more conductive than high-performance insulating glazing units (IGUs), so keeping the frame area to a minimum reduces the portion of the window that is most conductive and least insulating. Old aluminum window frames suffered poor thermal performance because aluminum conducts heat so well. If the inside of a conventional aluminum window frame is warm in winter, the frame will be conducting that heat quickly to the outdoors. The colder it is outdoors, the faster heat flows through the frame. It is hard to keep the inside of the aluminum frame warm, and typically it will get colder than the rest of the window. If there is enough moisture in the air, it will condense into water on the aluminum frame first. 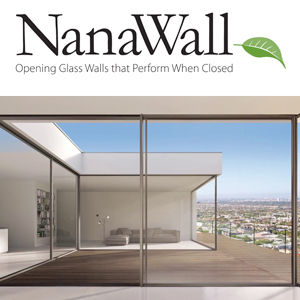 And the cold inside of the aluminum frame will cool the adjacent glass next so that you may even have water condensing on the inside of your windows. This can lead to mildew. And if you have windows sills of wood, sheetrock, or other materials that are not waterproof, you may get mold or decaying window sills. All of this is unsightly, requires cleaning, and may pollute the air inside your home, causing or contributing to health problems, particularly respiratory problems. In the summer, if the outside of a conventional aluminum window frame gets hot in the sun, the frame will bring that heat into the indoors---warming your home precisely when you want it to stay cool. That can force you to install air conditioning or to run air conditioning longer than you would otherwise need. Tanner. swissFineLine windows appear frameless allowing an invisible boundary between inside and outside without compromising thermal performance. Thermal isolation of the inside from the outside portions of the hidden frame along with triple glazing, warm edge spacers, low-e coatings, and gas fills for performance meeting the Swiss Minergie standard.